If potatoes grew on trees, they would be the national fruit of Switzerland. I have eaten more potatoes since marrying Dominique in 2011 than I ate the previous ten years. Dominique loves potatoes. I include them in soups, mash them as a side for baked chicken, chunk them up in beef stew, and bake them in cottage pie with ground beef, peas and carrots. 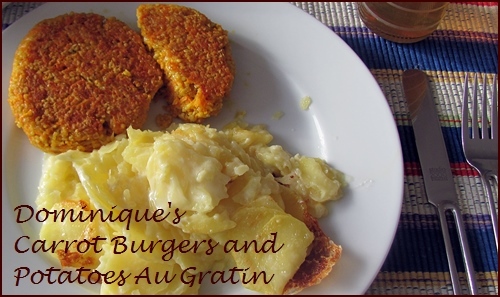 When Dominique takes over the kitchen, she makes potatoes au gratin, potatoes with melted Raclette cheese, and rösti. The only potatoes you don’t see much of in Switzerland is French fries. This is the land of sausages after all, not hamburgers and chicken nuggets. I have been watching Dominique make rösti for several years. It’s very similar to hashbrown potatoes. She steams and coarsely grates the cooled potatoes, then fries them in butter. She often adds cheese. I wanted to make something similar for a backpacking meal, but without using butter to ensure a long shelf life. Taking inspiration from Waffle House, the American restaurant chain that serves more hashbrowns than anybody else in so many ways… “Scattered, smothered, covered, chunked, diced, peppered, capped, topped or country,” I decided to go with topped – hashbrowns and chili. Steam small to medium size white potatoes with the skins on for fifteen minutes. You want them to be fully cooked, but not too soft. After potatoes cool enough to handle, remove the skins. 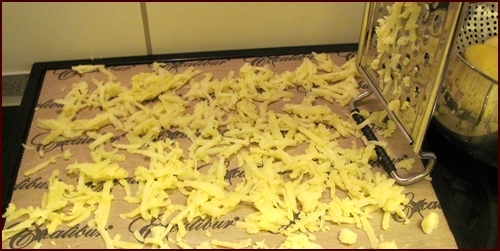 Using a coarse grater, grate potatoes directly onto dehydrator trays covered with non-stick sheets. Move the grater across the dehydrator tray as you go to minimize having to separate the grated potatoes with your fingers. They will want to stick together, so a light touch with your fingers to finish spreading them around is best. If parts of your potatoes don’t grate well, just set them aside and eat them later. You will get a little of that when there is only a little bit of potato left between your fingers and the grater. Dehydrate at 135°F (57°C) for approximately six hours or until crispy. You can flip the potatoes over after four hours to speed drying. They will hold together like a mat. Break into smaller pieces when dry. I steamed two pounds of potatoes which I grated onto two Excalibur Dehydrator trays. The yield was approximately two and a half cups dried hashbrowns. Click the chili link for my chili recipe. Combine chili and hashbrowns with water in pot and soak for five minutes. Bring to a boil for one minute, turn off stove and wait ten to fifteen minutes. Shake a little salt on meal as desired. Alternatively, you can prepare this meal freezer bag or thermos style by adding boiled water to the ingredients in the container. Wait about twenty minutes for best results. If preparing in a thermos for a meal that will be eaten several hours later, increase water by ¼ cup. Visit my Facebook page for the lastest posts. A few days ago I posted a recipe for Fruit Mash Leather using bananas, kiwis and blueberries – mashed instead of blended.